Viewsonic released a new line of Professional series of LCD monitors this Summer, and I’ve had the chance to put one through its paces for the past month. Professional monitors are designed with a focus on picture quality and colour accuracy without using any artificial enhancement. The best and only way to do this, is to use high quality components in the manufacturing process which results in a display capable of a natural picture to be displayed. 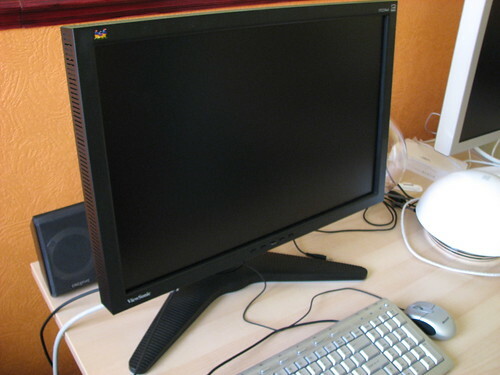 These kind of monitors are often used in production environments for designers and artists that work in the digital creative field and their work often revolves around the use of colour. Or more importantly, the accuracy of colour. So having a display that is capable of accurately showing the colours on the page of a 10,000+ production run of a magazine is crucial. The VP2250wb boasts a 21.6-inch viewing area with a 1680 x 1050 resolution, 300 cd/m2 brightness, 1000:1 contrast ratio or 3000:1 with dynamic contrast switched on and a 2ms response time. You won’t find any gloss on this monitor. Designed for the professional market, this monitor goes for the serious and cold industrial look. The display sits on a tough as nails base which has a large footprint, however it doesn’t actually take up too much space because of the three spoke design, which helps to keep the display steady when you’re adjusting the height, rotation or tilt. 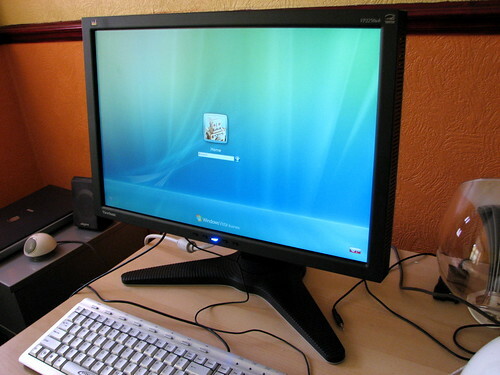 At the back of the display, you’ll find two connectivity options to your computer with VGA and DVI (HDCP enabled) as well as a generous four port USB 2.0 hub. A clever feature on the VP2250wb is that when you connect your monitor to a graphics source that is outputting a resolution higher than the monitor is capable of, it will automatically downscale that picture. This means your screen doesn’t just go blank when you connect up to your machine mid-session or in the event that your graphics card/OS doesn’t detect the correct resolution for the monitor on start up, typically resulting in a blank screen. The display can also be rotated in to portrait mode for a tall display, which also helps to give you easy access to the connections and ports on the underneath. 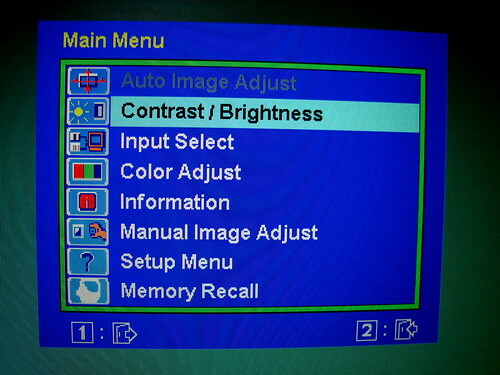 The menu system is standard for an LCD monitor, again going for the basic look and feel. Using the four buttons on the front of the display, you can adjust the usual settings such as contras, brightness and colour. You can also give the contrast and response times a boost for enhanced image quality when you’re taking a break from Photoshopping and getting in on some 3D gaming. The boosted response times and contrast ratio allows visuals to be smoother and colours to be more vivid, however for media such as high definition videos, these settings only make a slight difference. Viewsonic have made a good attempt at putting forward a monitor aimed at the professional market without the high price tag and in doing so they’ve had to cut out some of the features that are typically found on high-end displays. The first thing that some would point out on the spec sheet is that this display doesn’t use an IPS panel, instead opting for the cheaper TN panels. The choice of connectivity is fairly standard without options for DisplayLink or HDMI. The good news is that the compromise in display technology hasn’t resulted in compromised image quality. 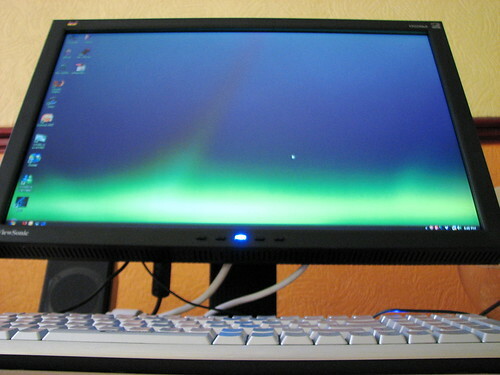 The Viewsonic is still a very capable monitor that packs the connectivity options you would expect including a USB hub built-in that doesn’t require an extra power source. For the price that this monitor is being pitched at, it’s hard to argue with the spec sheet. It’s a quality display that won’t break the bank even if you are a poor digital artist.